Estados social : regulaçao, economia e politica,in Revista de fiananças publicas e direito fiscal Vol1, March 2010. 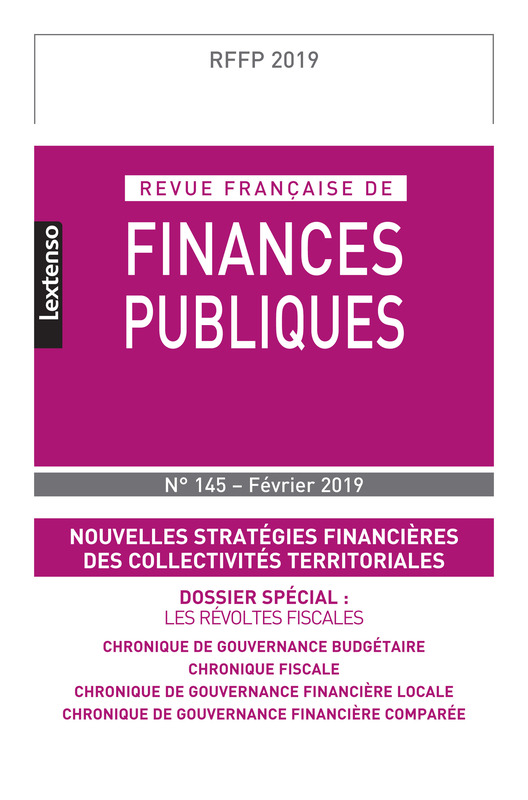 Multi-year planning, balanced public finances and new public financial governance (Programmation pluriannuelle, équilibre des finances publiques et nouvelle gouvernance financière publique) in Petites Affiches No. 16 - 23/01/2009. The eternal return of the body to represent politics (L’éternel retour du corps comme représentation du politique), in Mélanges en l’honneur de Jacqueline Morand-Deviller, LGDJ 2008. New public financial governance at the heart of the reform of the democratic State (La nouvelle gouvernance financière publique au cœur de la réforme de l’Etat démocratique), in Vigie No. 31- December 2007 (Quebec ENAP review). International symposium France / Quebec: Local tax autonomy in Quebec and France. Symposium organised by FONDAFIP and APFF. Opening statement. Introductory report: Local financial governance in transition. Paris (Senate), 6 November 2015. Third national day of the Financial jurisdiction trade union and the Trade union of managing directors of local authorities (Syndicat des juridictions financières / Syndicat National des directeurs généraux des collectivités territoriales). Report: Local financial governance in transition. Paris (Senate), 16 October 2015. Symposium DLR: Renting and the VAT compensation fund. Introductory report: VAT/VAT compensation fund and local financial governance. Paris (Senate), 28 September 2015. 9th international symposium Fondafip-Ministry of Finance of Morocco: Financial management of towns in Morocco and France. Opening and closing statement. General report: From towns to metropolises: economic growth and new policy. Rabat, 11 and 12 September 2015.
International symposium Fondafip/University of Finance and Economics of Beijing (China). Public finance reform in China and France: comparative approach. Opening and closing statements. Introductory report: Budgetary reform in France. Report: The new tax civic attitude in France. Beijing, 20 and 21 October 2014. Symposium 8th Fondafip-Ministry of Finance of Morocco: The territorial State in Morocco and France: what synergies between State finances and public authorities’ finances? Introductory and closing speech. General report: The new territorial State. Rabat, 12 and 13 September 2014. Conferences University of Bialystok (Poland). 20 March 2014: French law on tax control. 21 March 2014: Tax security in French law. 7th symposium Fondafip-Ministry of Finance of Morocco: How to monitor public finance reforms in Morocco and France? Introductory and closing speech. General report: Monitoring public financial reforms while faced with crises. Rabat, 13 and 14 September 2013. Symposium FONDAFIP-IDP of the University of Poitiers: What happened to tax policies? Opening statement of the symposium.Report: Ideologies and tax policies. Poitiers, 2 April 2013.
International symposium: Challenges of new financial governance in Brazil and France. Opening statement. Report: Challenges of local financial governance in France. Symposium organised by Fondafip with the support of Gerfip, the Sorbonne School of Law, and the Revue Française de Finances Publiques. University Paris I Panthéon-Sorbonne. Paris, 18 March 2013. Symposium: Transformations of public financial law. Opening report: Public financial law between order and movement. Symposium organised by Fondafip with the support of Gerfip and the Revue Française de Finances Publiques. University Paris I Panthéon-Sorbonne. Paris, 13 March 2013.
International symposium Italy / France: New challenges of public finance in Italy and France. Opening statement. Introductory report: New challenges of public finance in France. Symposium organised by the University of Bologna and Fondafip. Bologna, 23 February 2013.
International symposium Belgium / France: The influence of the European Union on the public financial policies of Member States. Opening statement. Report: The influence of the European Union on tax policies in France. Symposium organised by the University of Mons and Fondafip. Charleroi, 12 February 2013. Regional seminar of the IMF to disseminate the new budgetary directives of the CEMAC Yaoundé (Cameroon), 3 December 2012. First report: CEMAC directive: objectives, innovations, challenges. Second report: The transposition of CEMAC directives into States’ domestic law. International symposium Quebec-France: Fiscal justice. Symposium organised by APFF, the Chair of research in taxation and public finance of the University of Sherbrooke, and FONDAFIP. Opening statement. Introductory report: Fiscal justice, tax legitimacy and post-modern society. Montreal, 22 November 2012. (Quebec; Canada). International symposium Morocco / European Union: An institutional convergence for the success of the advanced status. Introductory report: Challenges of the advanced status for Morocco and the European Union. University of Fez, 12 and 13 November 2012. 16th International conference on tax law of the Brazilian association of tax law. Report: Contencioso administrativo e judicial em materia tributaria e metodos alternativos de soluçao de disputas. Belo Horizonte (Brazil), 20 September 2012. 6th symposium Fondafip-Ministry of Finance of Morocco: Public finance transparency in Morocco and France: towards a new model. Introductory and closing speech. General report: Public finance transparency: which model? Rabat, 7 and 8 September 2012. Symposium FONDAFIP/AFIGESE, Financial autonomy of local authorities in European Union countries. Opening report. Paris, 27 June 2012. Symposium FONDAFIP-IDP of the University of Poitiers: 30 years of financial decentralization. Opening statement of the symposium.Report: The material and theoretical context of financial decentralisation. Poitiers, 3 April 2012. Symposium of the University Paris 13 CERAP: Rebuilding income tax. Report: Fiscal justice and income tax and chairman of the round table on The progressive nature of income tax. Paris, 20 January 2012. Symposium KPMG/Economic, Social and Environmental Council. Ten years after the LOLF budget framework act. Introduction and hosting of the round table: LOLF and public management. Paris, 16 December 2011.
International symposium of the University of Mons CERCP and Fondafip: Public financial challenges in Belgium and France. Introduction of the symposium and report: Budgetary reform of the State in France. Mons (Belgium), 5 December 2011. Symposium, From the Tax Council to the Mandatory Tax Withholding Council. Introduction of the symposium and chairman of the session. Court of Auditors/Fondafip. Paris, 30 November 2011.
International seminar of the local law institute of the Autonomous University of Madrid, Gobierno local in Francia. Report: Las crisis y la nueva gobernanza financiera local en Francia. Madrid (Spain), 18 November 2011. Symposium Fondafip: Consolidation of public accounts. Opening, chairmanshop and closing. Paris, 11 October 2011. Symposium Fondafip/Association française de droit constitutionnel: Constitution and balanced public finances. Introductory and closing speech. Presentation: Conditions for the effectiveness of balanced public finances. Paris, 30 September 2011. 5th symposium Fondafip-Ministry of Finance of Morocco: Consistency between public finance in Morocco and France. Introductory and closing speech. Report: Consistency of the public financial decision-making process. Rabat, 9 and 10 September 2011. 15th International congress on tax law of the Brazilian association of tax law. Report: As crises e as repartiçao de competencias entre o estado nacional e as coletividades territoriais. Belo Horizonte (Brazil), 17 August 2011. 4th Congress on international tax law of the Brazilian institute of tax law. Report: Mobilizar e reinventar o imposto : uma resposta as crisas. Sao Paulo (Brazil), 22 August 2011. Symposium Brazil / France of the Law Faculty of the University of Sao Paulo (Brazil): Comparative financial and tax law. Report: Novo civismo fiscal e legitimado do imposto.Sao Paulo, 24 August 2011. Symposium of the Ministry of Finance of the Dominican Republic: Desarrollo territorial, transparencia e institucionalidad. Introductory report: Territorial development and good governance. Santo Domingo, 5 and 6 July 2011. Symposium University Aix-Marseille III, Good tax governance. Chairman and introduction of the round table Progress towards good tax governance. Aix-en-Provence, 27 May 2011. 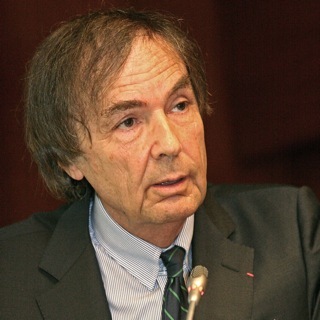 Tribute to Philippe Séguin organised by Fondafip with the support of the Court of Auditors at the University Paris I Sorbonne, 5 April 2011. Presentation: Philippe Séguin, chairman of the Mandatory Tax Withholdings Council. Symposium University of Poitiers IDP and Fondafip (Poitiers, 25 March 2011): Public finance and old age.Summary report. Symposium of the MADP Chair of Sciences Po and Council of State (Paris, 11 March 2011): The future of the French model of public law in Europe. Presentation: Founding principles and limits of public intervention: the case of public financial law. International symposium, New public finance governance in Morocco and France: what perspectives? Report: The three ages of local financial governance and State. Fondafip/Ministry of the Economy and Finance. Rabat, 18 and 19 September 2010. Symposium of the Sorbonne economics centre; 2 June 2010; Report: Compliance and tax law: converging views. Symposium of the Institut de Sciences Politiques de Paris, Local authorities faced with reforms. Paris, 4 May 2010. Report: Public finance reform. International symposium Fondafip-University of Krakow, New public financial governance in Poland and France: challenges in a crisis environment, Krakow on 8 and 9 March 2010. Opening of the symposium and introductory report: Public finance crises and State reforms. International symposium Fondafip-University of Liege, Public finance, programming and economic crisis, Brussels, 12 February 2010, Opening of the symposium and introductory report: New public financial governance and crises. Symposium of the University of Savoie, Chambery, 5 February 2010: Principle of sincerity in public finance. Summary report and chairman of a round table. Conference of the Congress of the Association des régions de France (Marseille, 10 December 2009): Report: Reform of professional tax. Conference at the 13th International congress of the Brazilian association of tax law (Belo Horizonte; Brazil, 13 November 2009). Closing report: Existe segurança jurídica numa sociedade pós-moderna complexa? Conference at the European Forum on the future of the administration and local authorities: Impacts of decentralisation on public finance. Paris (Senate), 21 November 2008. Conference at the international symposium of the Instituto de direito economico financeiro e fiscal of the University of Lisbon, 24 June 2008: Portugal/Uniao europeia e os EUA navas perspectivas economicas num contexto de globalzaçao. Report: Desenvolvimento sustensavel des finanças publicas : que contrato social para uma nova geraçao ?. Conference at the International Savings Day, Portuguese Court of Auditors, Lisbon 31 October 2007. Report: Public savings, private savings and new public financial governance. Conference at the AFIGESE congress on 27 September 2007 (Strasbourg): Performance logic and new public financial governance. Conference at the symposium of the Court of Auditors, 24 and 25 September 2007 (Paris): Experts and politicians: the new alliance between the Court of Auditors and Parliament? Opening and closing of the international symposium France / Morocco: Public finance reform in France and Morocco, Rabat, 15 and 16 September 2007 (symposium organised by GERFIP, FONDAFIP, Revue Française de Finances Publique and the Ministry of Finance and Privatisation of Morocco). Conference at the Ministry of Foreign Affairs of Poland: Performance logic and new public financial governance (Warsaw, 11 September 2007).